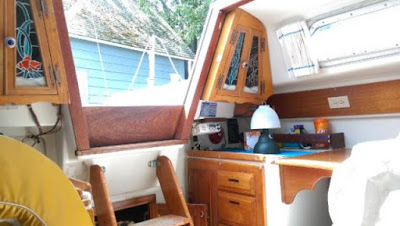 On a pocket cruiser a functional galley is a must, and for any galley to be truly functional it must have counter space. The problem is that most pocket cruisers, by there very nature, lack the necessary area for counter space in their galleys. 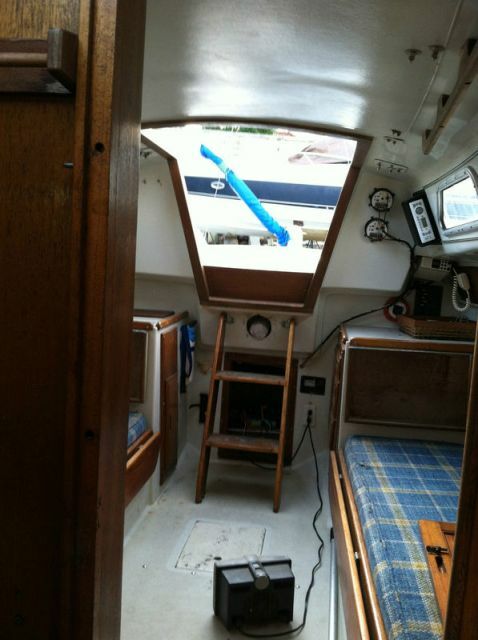 When I purchased Oystercatcher in the fall of 2009, her galley was not very functional at all. Her owner had used her for day-sailing from his dock, but he never appeared to have used her for cruising. The galley seemed little used. 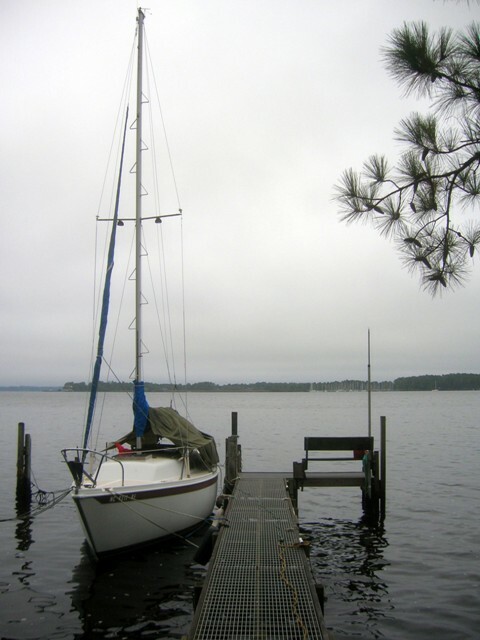 On the day of my purchase of the boat, the former owner allowed my friend and me to spend the night on the boat at his dock (before sailing away with her the next morning). Since there was no counter space, we had little choice but to pile up our stuff in the galley sink and on top of the galley stove. When I got back home with the boat, I started to think about how I could add some counter space to this small galley. 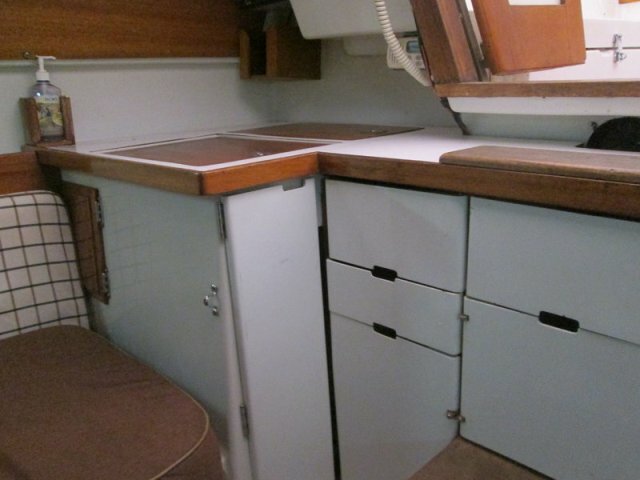 I found numerous examples of other Ericson 25s with hinged counter extensions in their galleys. 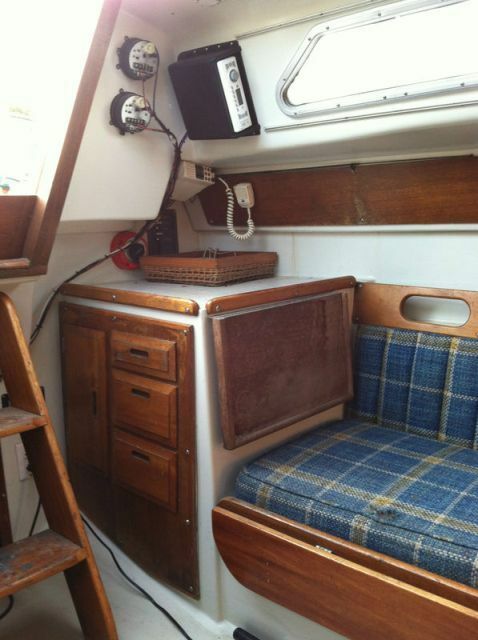 On the same say that I first visited Oystercatcher, I looked at another boat that was for sale - an O'Day 25. 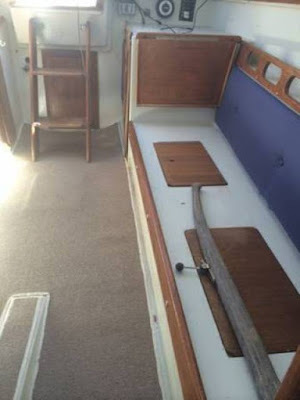 It's galley spanned the companionway. Another O'Day 25 that I looked at online had a similar galley configuration. 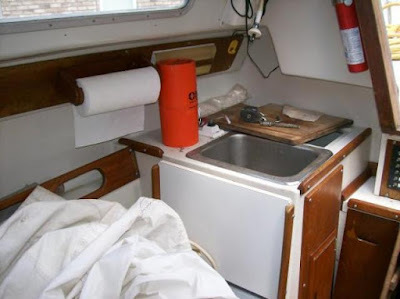 The designer of the O'Day had allowed some room for counter space, but we must keep in mind that this empty counter space was where most owners would place a portable stove (that they would stow beneath the counter). 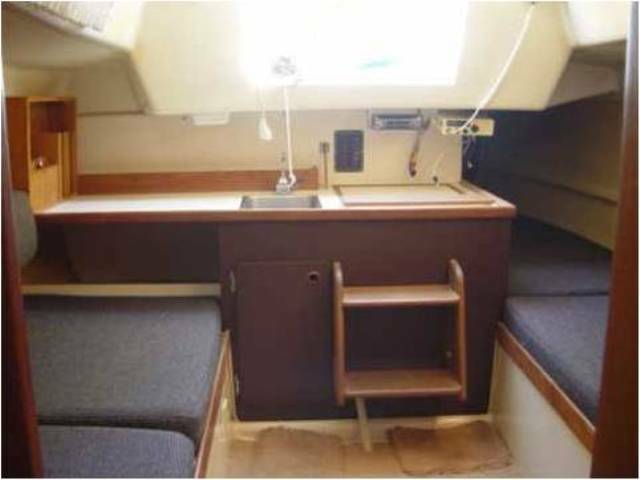 I also discovered online an Ericson 25 owner who had built small cabinets and counters on either side of his boat's companionway. 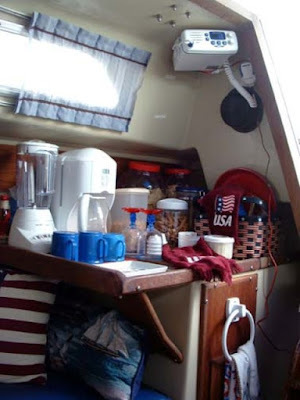 These modifications seemed to provide more space for the storage of pots and pans than counter space, so I continued thinking and wondering. I also found online an Ericson 25 owner who had extended the stove area of his galley on the port side of the boat. 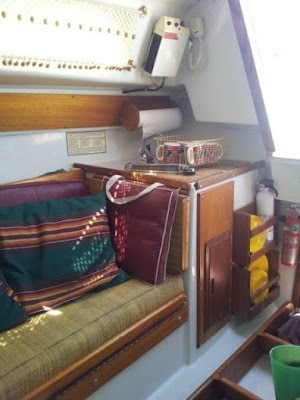 This modification did not seem to add a lot of extra counter space, and it certainly rendered the settee on the port side unusable as a berth, unless of course that owner intended a child to sleep in that berth. 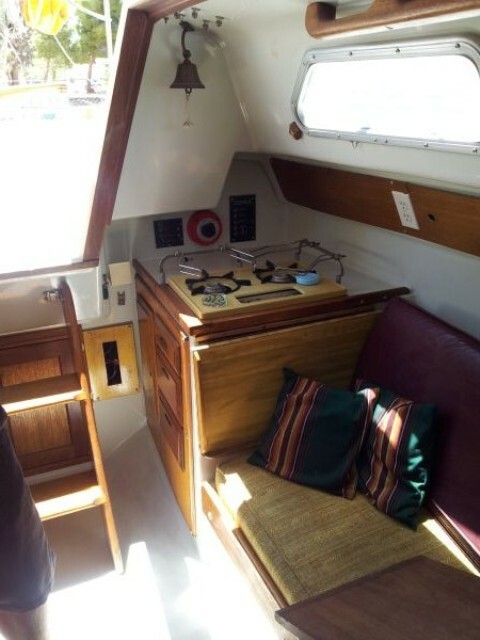 At the same time I communicated with an Ericson 25 owner who had recently purchased his boat from an owner who had completely reworked his galley by building cabinets across the companionway. I liked what I saw, but I knew I did not want to build cabinets across my companionway. I wanted to maintain full access to the lazarette behind the companionway stairs. I figured the only way I could do that would be to build a table that could serve as a temporary counter when needed. 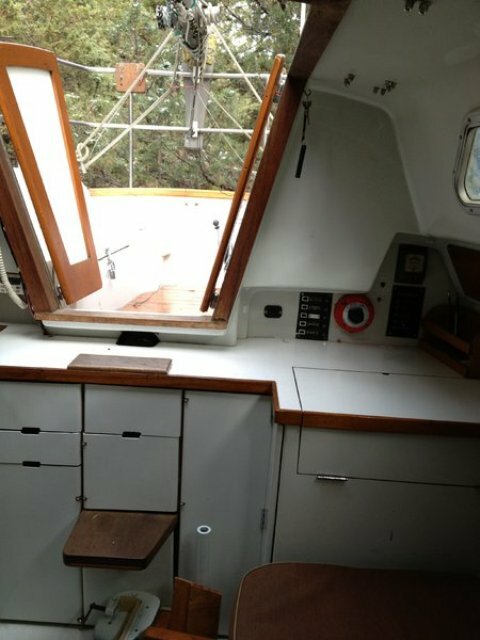 This led me to construct a tiller-mounted cockpit table, one that would double as a cutting table in the galley. I designed it to span the distance from the sink to the stove. 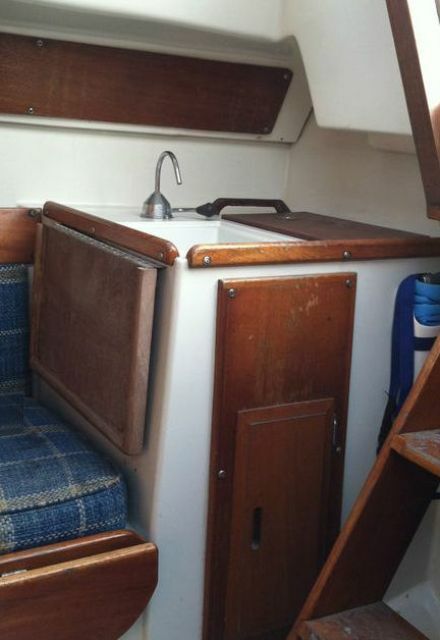 The only drawback would be that when using it in the galley, there could be no travel back and forth to the cockpit. 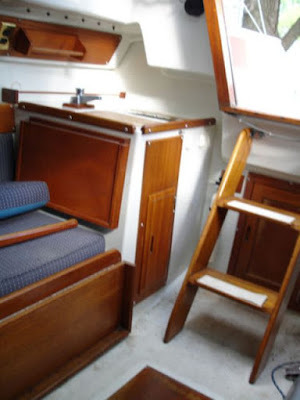 I planned to stow this table between the companionway ladder and the stove. I made mahogany fiddles for the table that resembled the mahogany fiddles in the galley. While I was doing this work, I was also busy with my construction of a mahogany table for the main salon. 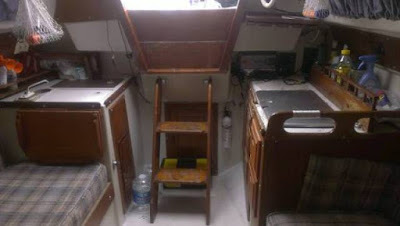 This table, I figured, would also be useful in the preparation of meals. 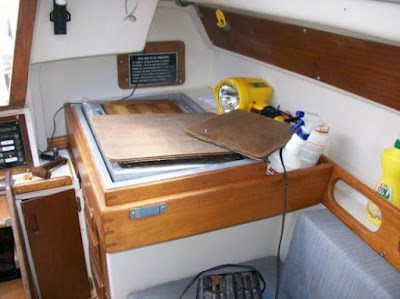 Nevertheless, I continued to think that it would be helpful to build counter extensions on the port and starboard sides of the galley, similar to those hinged counter extensions that other Ericson 25 owners had constructed. 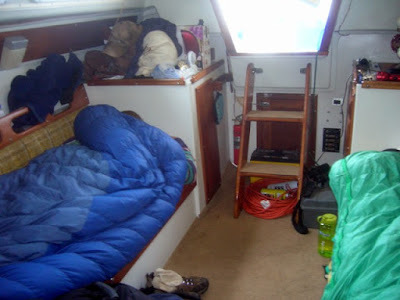 My work on these counter extensions is the subject of the series of postings that follows.